Hope all is well in your neighborhood, I have been greatly enjoying the warmer weather these past few days in my own. I am very much looking forward to Springtime, I have never really been a fan of Winter but I know that without the cold season, I wouldn't love the rebirth of Spring near as much. And really that is what it boils down to for me, I really like the changing of this season. Springtime with all the blooming trees, the Cherry Blossom & Blooming Plum, the Lilacs coming into their full sweet scent with soft purple hues, the earth awakening with the first glimpse of green in it's grass. I simply savor all these wonderful & amazing changes. Second to Spring - is Fall - I just love that there is so much to do in the Fall - all the festivals, the 'Ren' Fest, the circus, those are all a few of my favorites. Hoping to get lots of neighborhood walks in this Spring, lots of 'park' time for the girls to burn off some energy, even more 'pool' time @ the YMCA so that our oldest will become even more comfortable in & around the water. So we'll see! Well are you all ready for my news?!!! 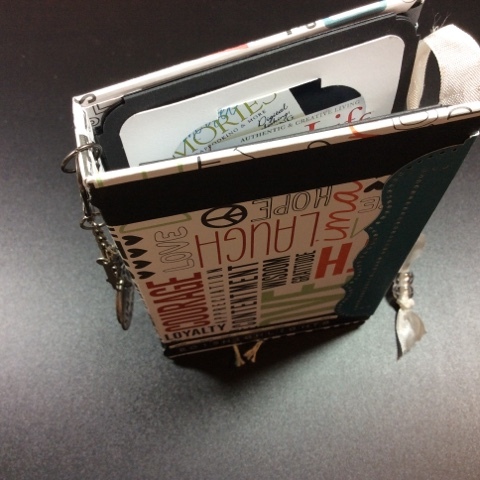 I am officially a Scrapbook Designer! I signed my first contract on Thursday with "The Scrapbook Page" in Shawnee Mission, Kansas. So I am now a 'Page Girl'! : ) I posted a few weeks ago that I did their team tryout challenge ... well they like me and asked me to join their team for the next four months, so as I begin this journey I am going to try super hard to post more frequently so that you can join me in my new adventure. Just to give a quick recap, here are a few photos of my favorite project (I actually turned in 6 for the tryouts), these photos are of my process in creating the mini heart album. The first step obviously was to get all my butterflies cut out, I used this Sizzix die. Once they were done I used Antique Linen distress stickles (here) on the 3 card stock butterflies, which is the one I used for the bottom layer, to give it some shine. Then for the 3 patterned paper butterflies (used as the top layer), I added the cystal gems down the center to represent her body and then used the brown fiber to act as her antennas. The whole idea was rather ingenious I thought and made for a really nice addition to the mini. Here is what the butterfly looks like all put together. The double layer I think certainly gives it the dimension that I was going for, and added to the bottom layer with it's shine helps it to really stand out. Here is one of the butterflies in the mini, unfortunately I didn't think to take a side-view photo so that you could see the bottom layer and it's shine, but trust me, it is really cool. Well that's all I have for you today- hope you enjoyed. I hope that you'll venture back around to check out some other things I have coming soon. Thanks for joining me! Great bews! And super cute butterfly. This is going to be great experience!